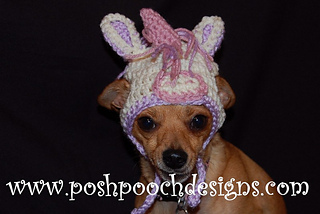 Rainbow Unicorn Dog Hat Crochet pattern has been updated, re-tested. there are new pictures and stitch counts edited. Leave the horn off and you got a pony hat! The hat has comfy ears and worked in ties, to keep the hat on active pooches. Fun Pattern that works up fast. Has ears, cute horn, mane and worked in ties. Crochet pattern will be shipped via email in a PDF file within 24 hours of purchase.